Mango Languages For Homeschoolers, A T.O.S. Review | My Journeys Through Life . . . Herding Cats In New Mexico! ← Windows 8.1 Is NOT Fun . . . Not At All! My regular readers are very aware of my seemingly never ending quest to actually learn Spanish with my kids, so when, as a Schoolhouse Review Crew member I was given an opportunity to test drive something new from Mango Languages, I really wanted to give it a try. Up until now, Mango Languages has been available to be used in businesses, schools (K – 12), and in many libraries (though not OUR library system, I checked). But Mango Languages is now introducing Mango Homeschool Edition, which is very exciting news! Now, I want to tell you right up front that when I say we are test driving it, I mean that. Mango Homeschool Edition is currently a beta version. However, there is still a great deal available to the subscribing family! I will be pleased to see better tracking methods however, allowing me to see exactly where the boys are in their progress, along with being able to set goals and lesson plans. During our review period, we were given a one year subscription to Mango Homeschool Edition for five students (which included one for me as the homeschool mom/teacher). To be honest, once we got our log in information and went to get started, I decided that during the review period I would concentrate solely on “The Artist” for this review. In retrospect though, I think the others probably could have handled it, considering that there were only certain portions of the program I was willing to let him use, so I’ll likely be adding the others in, and maybe even letting them choose what languages they want to try (in addition to Spanish). We (meaning I) chose Latin American Spanish. It was a little bit confusing getting set up, but then after watching the little videos that are provided, and doing what they said, I got everyone’s accounts set up (that way, when I decide to put the other boys in, we are already set up!). For the portions we actually used, navigation was quite simple, “The Artist” would just log in to his account, and then into his “Space”. Here he is during one of the lessons . . .
Whatever language you choose, it will include things such as native speakers giving you audio lessons and pronunciation help, a voice comparison tool (but you need a microphone for this, which we did not have available), which is completely optional, you can do the lessons without it. Not only will you be learning the language, but you will be receiving information about the culture, the customs and the etiquette of the land of your chosen language. There are also grammar and conversational aspects as part of your lessons. Each unit is referred to as a “Journey”, and is fairly simple to understand, done in flash card style. I do like that. Below is a quick video I snuck while “The Artist” was working in an early on lesson . . .
After that, he wouldn’t let me anywhere near if I had the camera, can you believe it??? Also available on the Mango Homeschool Edition is the “community” aspect of the program. We did not use this portion. 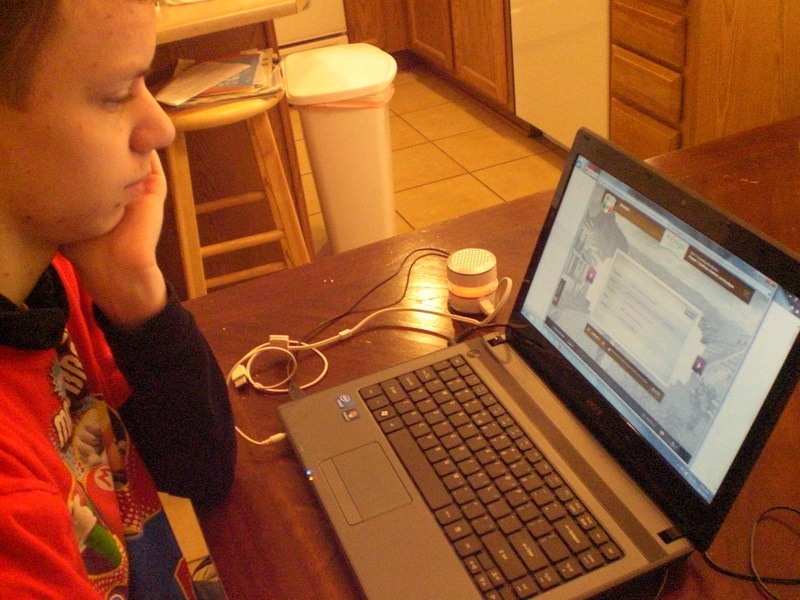 It involves online chatting in forums and “eNotes”, a private messaging section. My husband and I are very wary about this sort of thing for our kids, and even though I know that at Mango Homeschool Edition they are working very hard to make certain this is safe for kids, the fact is that this program is being touted as perfect for kids and adults. I just don’t want to take the chance with my kids. OK, now the bottom line . . . The above is the introductory pricing, and is accurate at the time of this posting. MY bottom line? I probably would not purchase this for our homeschool. I have four children, with special needs, and a lot of what is available on this program is just not going to be useful for them. I would HIGHLY recommend it to someone preparing to travel, however, as I think it would give them enough conversational (whatever their choice of language) to get around. 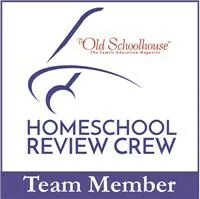 To find out how other Schoolhouse Review Crew members felt about Mango Homeschool Edition, please click the graphic below!